The Everybodyfields | True Endeavors Presents: music, tours, tickets, mp3 downloads, concert pictures, videos, Madison WI. 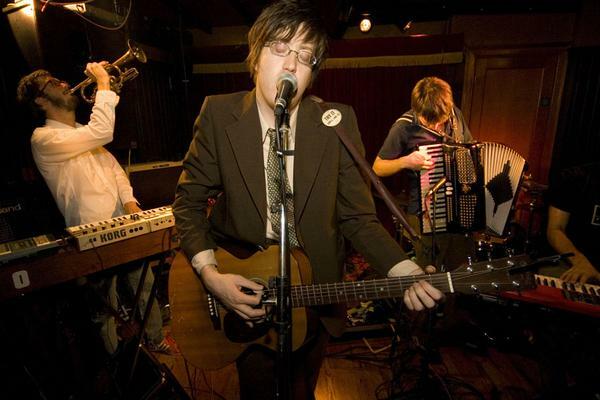 Media Roundup: Okkervil River return! And the concert announcements keep coming! After all-but stealing the show when opening for the New Pornographers at the Orpheum two months ago, Okkervil River have already planned their return trip to Madison. The band will headline a show at the Barrymore Theatre on Sunday, September 14, in support of the impending release of their new album, The Stand Ins, on September 9. with tickets already available. This one is a sure sell-out, so don’t miss this one, kids. (Check out this piece from Paste Magazine for more info on the tour and Okkervil’s forthcoming release). As discussed in previous entries, last evening’s Silos concert at High Noon was a benefit for Drew Glackin, the band’s bassist who tragically passed away earlier this year from a thyroid condition. Isthmus’ Marc Eisen candidly discussed his experiences with Glackin in a touching editorial earlier this week, and it is certainly worth a read. Rest in peace, Mr. Glackin. Two upcoming shows in town, Ingrid Michaelson tomorrow (Saturday) evening and Stephen Marley next Wednesday, June 11, both at the Barrymore, have also been garnering local media attention this past week. Read Michaelson’s interview from the Capital Times and story in the Isthmus, as well as the Cap Times’ Marley profile. As it has been underscored in many previous entries on this blog, I thought it would mentioning the Rolling Stone’s interesting feature on the “new music economy” — a world where it’s beginning to seem that some bands can earn more cash licensing tunes for commercials than selling albums. The music industry is a very different animal than it was even five years ago, and It’s an important read for musicians and music fans alike. Bogged down at the office and haven’t made it to as many shows as you’ve liked? As usual, below are links, reviews and interviews from the past week of shows, including the Nels Cline Singers, the everybodyfields and Langhorne Slim. And that’s the roundup! Have any thoughts on recent shows? Photos you’d like to share? Let us know, either through email or by leaving a comment, because we’d love to hear from you.